For a short oversight over the algorithm use, see Spouge’s_approximation over at Wikipedia. WordPress’ code colouring has no template for calc-scripting, so I just use C++, it’s similar enough. To keep those precious coefficients that we calculated at the sweat of our brows, we put them a in a global list for easy recycling. Cache for the variable independent coefficients in the sum. We calculate the natural logarithm of the function —which is different from ! —for the right half of the complex plane, that is . It seems that in some versions of Calc the placement of the left curly bracket is not as free as it should be but must be where I put it and as you can see: the variables must be declared before use in the way seen above, i.e. without commas. epsilon( 10^(- digits( 1 / epsilon() )+1 ) ) does not change anything. The coefficients are computed with a certain precision which we want to keep. The precision I mean. The calculation of , as described elsewhere in detail, needs only low precision, so it might be a good idea to reduce 1/epsilon to a small number, calculate and return to the old, higher precision afterwards. Next switch to some higher precision. But how much is some? Well, it is a known problem, the calculation of the precision that is needed in relation to the argument z to compute enough correct digits. The main culprit here is the alternating sum. There is not much that can be done for a sum of arbitrary length. There are some ways for sums of small fixed length, see for example the way the people of the math-library at Boost ( John Maddock, Paul A. Bristow, Hubert Holin and Xiaogang Zhang according to the footer at that page) implemented the Gamma functions by way of the original Lanczos’ approximation in a more tricky way.
. With this implementation that means that at least digits(int(1/epsilon) are correct, starting from the beginning, that is the highest digit not the first decimal. Please keep in mind that calc was not meant to be a highly versatile and still fast arbitrary precision floating point calculator but rather a tool for generating and manipulating primes, at least that’s how I understood it. There are other tools that fit that description better (e.g. : PARI/GP but be aware that lngamma() in PARI/GP has a different branch-cut so our log(gamma(z)) is not necessarily equal to PARI/GP’s lngamma(z) on the complete complex plane. Yes, I just repeated myself) but the gamma-function is such a generic tool, it just needs to be in every tool-box. As are the Bessel functions, but I’ll leave that for another time and post. Calc has integer division. Normal floating point division is done with a single slash 3/2 == 1.5 and integer division with two slashes 3//2 == 1. Before we are able to fill the list with our coefficients we have to clean up from the work done before, for it could have been done for some lower precision. TODO: delete coefficients if precision is lower than the last call. The list Ck is a linked list, remove() removes the last entry in the list. The list does not grow very large and is filled with just integers, so no headaches here or cursing of the authors. The computation of rest of the the coefficients is rather simple and nearly straight-forward. That was all! Now put it all together, reset the precision, and return the result. For the left half of the complex plane, some needed checks and balances and the obligatory etc. we build a wrapper. Two wrappers to be exact. The first one is for . The reflection formula is known to be . Next: The logarithmic derivatives of the Gamma-function generalized as the polygamma-function. I will implement it by way of the Hurwitz-zeta function, the two-variable zeta function, with the exception of the digamma function which will get a special treatment. No, I will not use the already computed Spouge coefficients for the digamma function, I found a different formula faster. “Angstzuschlag” is the colloquial geman word for “corrosion allowance”. This entry was posted in Algorithms, Computing, Mathematics and tagged Calc, Code, Example, Gamma, Implementation, Spouge on 2013/06/29 by deamentiaemundi. Was pictured by a grumpy old man in her bend. Caught eating her groom in the Lent. Original sizes of the pictures above at my Flickr page, linked to at the right side of this post. 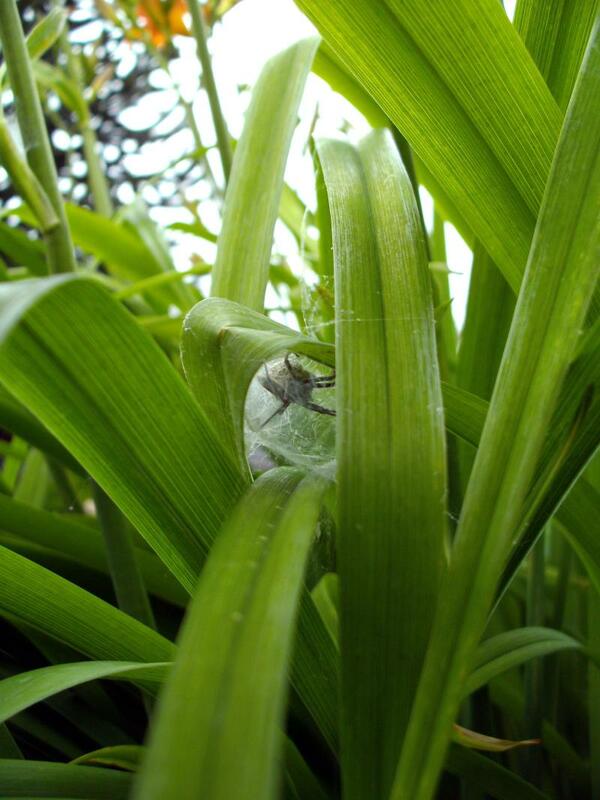 This entry was posted in Arachnoday, Flora & Fauna and tagged Arachnoday, Limerick, Nursery Web Spider, Spider, Spiders. 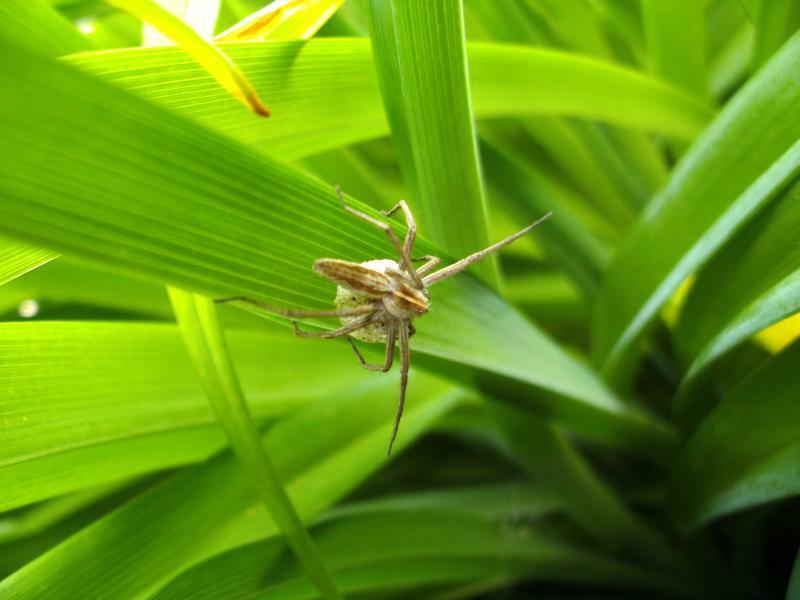 Pisaura mirabilis on 2013/06/25 by deamentiaemundi. Hungry bumblebee, trying to break open a rhododendron bud. I found this little critter flying around our purple rhododendron, visiting the nectar providing blossoms and tried to make a picture of it. It took me some time to persuade my cheap little diggi-snapper to switch to the macro-function. After the first nice picture of the bumblebee visiting an open flower and doing what bumblebees do inside an open flower (let me assure you: it looks quite a bit like…uhm…) the insects jumped to the adjacent blossom which was still closed. We botanists call that thing a bud. So it sat there, right on the bud seemingly doing nothing, taking a break or something. If it had not been for the nice profile I would have waited until it visits the next open flower (I think I’m still bound to the very finite number of pictures available on celluloid in my thoughts instead of the over thousand that fit on the 8GB card tucked in the camera). It was only later at the large monitor that I saw the curious behaviour. With the help of the large monitor it was also possible to identify the species: Bombus terrestris which has a long proboscis of about 8-9 mm (don’t know how much that is in old money) which could be long enough. I made a handful more pictures which you can see (in full resolution now) at my Flickr account. Please follow the link in the Flickr-plugin. PS: And at some day in a future far away I will be able to spell “Rhododendron” right the very first time. 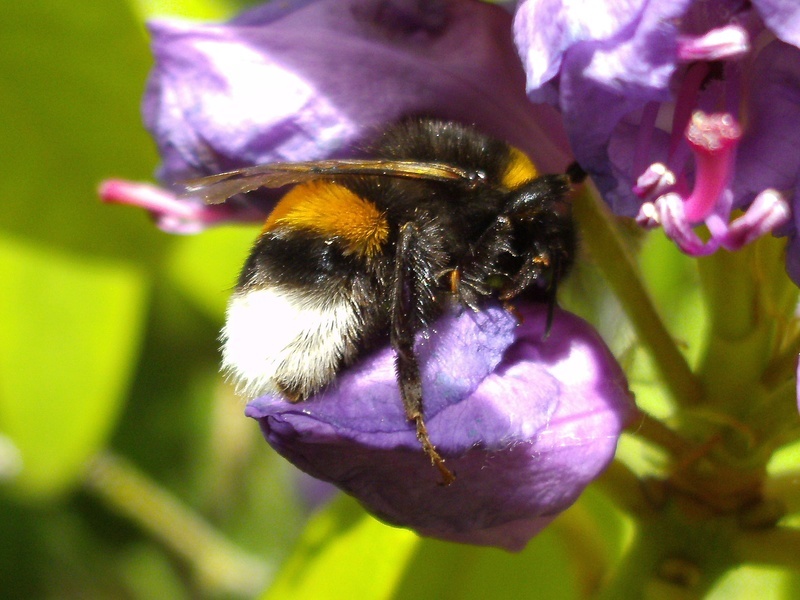 This entry was posted in Flora & Fauna, Garden and tagged Behaviour, Bombus terrestris, Buff-tailed Bumblebee, Bumblebee, Large Earth Bumblebee, Rhododendron on 2013/06/21 by deamentiaemundi. I do not know if the identification is correct, the picture is of low quality and the spider disappeared before I was able fetch more details (you need the face and the underside to get a more certain identification). 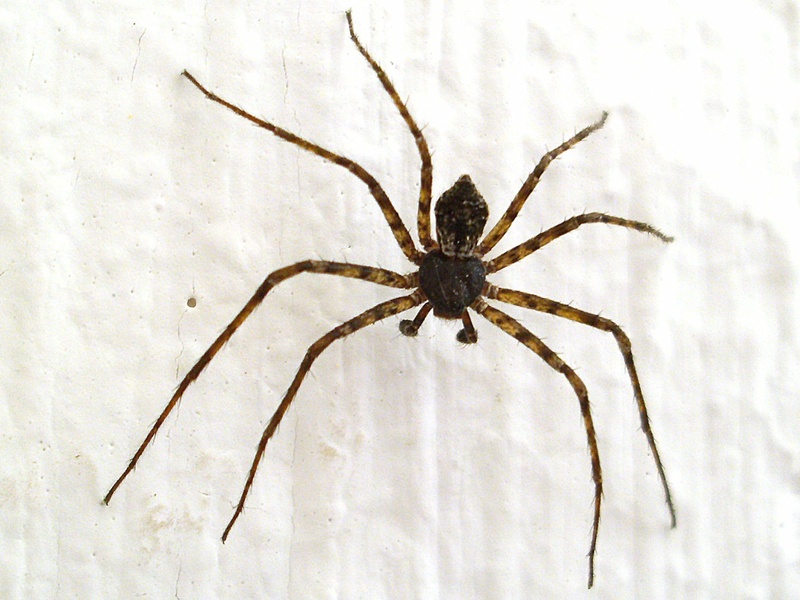 This entry was posted in Arachnoday, Flora & Fauna and tagged Arachnoday, Spiders, Tegenaria domestica) on 2013/06/16 by deamentiaemundi. Sleeping! 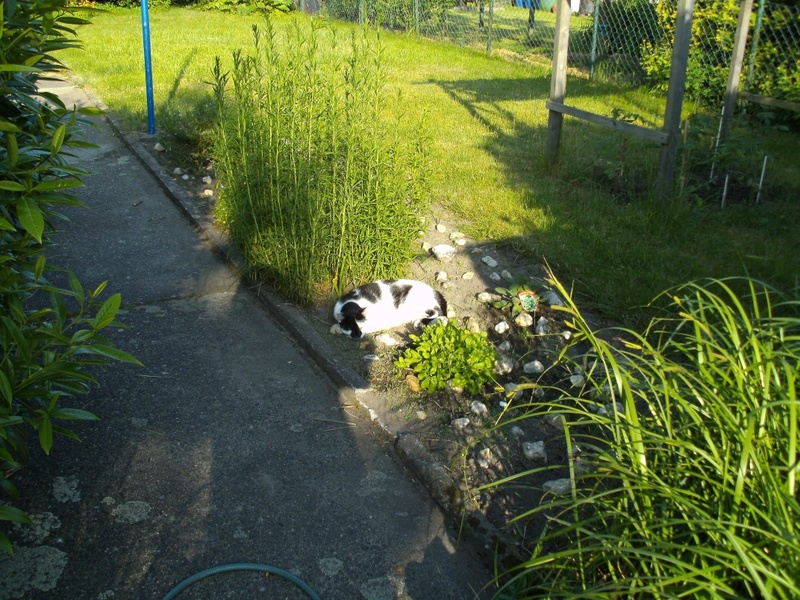 In the middle of my herb bed! See where it laid its head on? Yes, that’s a stone. 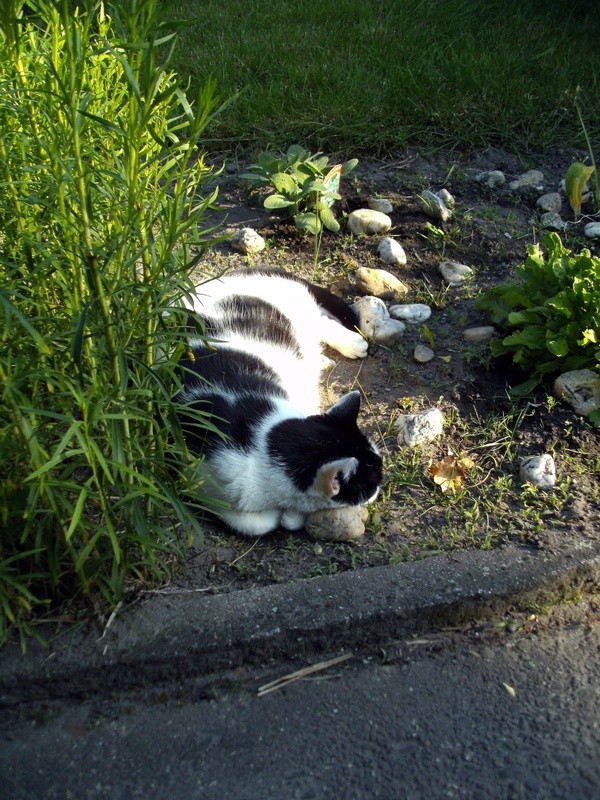 Quartz, to be a bit more exact, rolled round by the powers of the water of the river Rhine, buried under some soil when the Rhine meandered away, digged out again, and placed carefully in my herb bed to keep the cats—especially this cat—from using it as their litter box. And now? Now this brute rests its head on it like on a well aired cushion filled with the finest eiderdowns! If it weren’t for the proof by these pictures, one would have a hard (ha ha!) time to believe it! 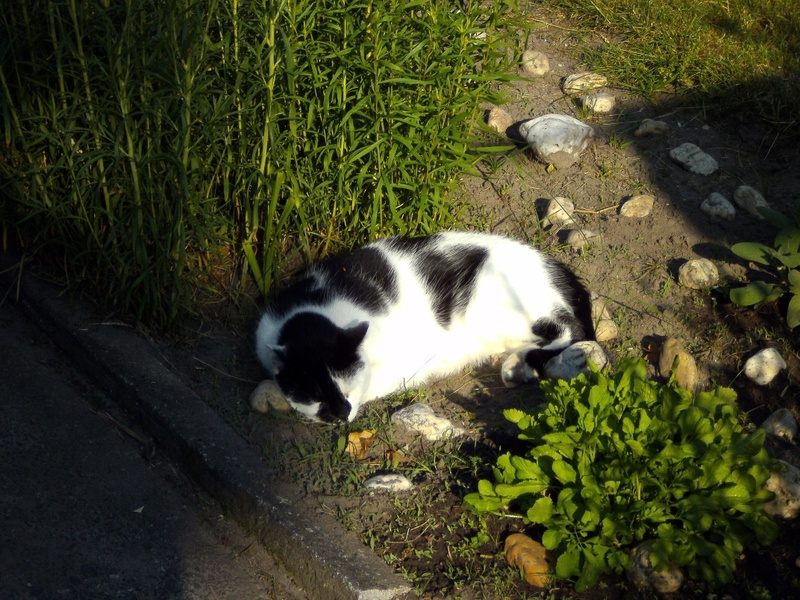 This entry was posted in Flora & Fauna, Garden, Rant and tagged Cat, Cats, Herb Bed, Litter-Box, Rant, Rhinestones on 2013/06/11 by deamentiaemundi.